The Spring Projects Drive launches at the March General Meeting! Show your love and support for our community partners Alliance for Children’s Rights and Daybreak at The People Concern. 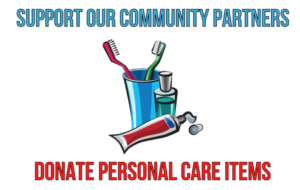 From March 12, 2019 until May 12, 2019 the Projects Council will be collecting personal care items for people in need. During your next trip to the drugstore, please consider picking up an extra toiletry item such as a toothbrush, toothpaste, deodorant, shampoo, soap, or face wash. These can included full-sized or travel-sized items. Drop off your items at the General Meeting on March 12, 2019, or at Rainey House. You can also purchase items on Amazon and ship your donation directly to Rainey House. Alliance for Children’s Rights and Daybreak at The People Concern have put together Amazon Wishlists to make the shopping easier. Receipts and an in-kind donation form must be provided for credit.